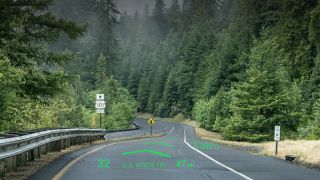 The idea of having a head-up display (like the Garmin HUD) on your windshield that guides you around, points out hazards and feeds you real-time information, all without the need to look away from the road, sounds like it should make driving safer. But a recent study suggests the exact opposite. The study, which is by the University of Toronto, states that added visual information actually divides the attention of the driver, and that having multiple pieces of information in the same visual field can actually be confusing. Spence and two of his students, Yuechuan Sun and Sijing Wu, used a set of computer-based trials to test people’s awareness and the impact of added information. The tests had users reporting on a number of randomly arranged spots displayed on a screen with particular attention paid to speed and accuracy, and then having those users report on whether or not they noticed a secondary stimulus appear during the trial in the form of a black square outline. Accuracy was high, until the square started making its way into the picture – it was missed around one in 15 times on average, with the number of times missed increasing to one in 10 times as more spots were added. Has Jaguar found the head-up display sweet spot?